Citation: C N Trueman "The Battle for Berlin"
The Battle for Berlin all but marked the end of World War Two in Europe. The Battle for Berlin, along with theBattle of Britain, the Battle of the Atlantic and D-Day, was of vital importance in the European sector. It was fought between April and May 1945, and the Russian victory saw the end of Hitler’s Third Reich and the occupation of the city by the Red Army before it was divided into four as a result of the wartime meetingsbetween the Allies. As the Red Army pushed across Poland to the River Oder they could muster a very strong fighting force – and completely outnumbered the Germans in terms of men and equipment. Alex Popov, 5th Shock Army 1945. By the time the Red Army reached Berlin these forces had markedly increased on both sides. The fear of the Russians in Berlin was such that both young and old were put into the front line. Nazi propaganda had demonised the Russians and many Berliners saw the forthcoming battle as simply a fight to the death. 45,000 of Berlin’s defenders were either children or old age pensioners. Joseph Stalin had effectively ordered his two leading generals – Zhukov and Konev – to race to the German capital. With such a huge advantage in manpower and equipment, getting to the actual capital was relatively easy in that the Germans were constantly retreating whereas the Russians had the advantage of forward momentum. However, both Zhukov and Konev knew that the battle for the actual city would be very difficult. Despite the obvious hopelessness of the situation, Hitler still planned to direct the defence of the city himself putting his faith in the German 12th Army that had withdrawn from the western front. Over two million artillery shells were fired into Berlin and the surrounding area in three weeks and 1 million Russian infantry troops took part in the assault on the city. Russia’s vast tank superiority counted for little in the debris ridden streets of Berlin. The Germans who fought there were issued with portable anti-tank weaponry and could use hit-and-run tactics against Russian tanks. Areas had to be taken street by street and building by building. Casualty figures on both sides were high. The Russians simply destroyed a complete building if they had been fired on from somewhere within that building. However, the city could not last out for long and on May 2nd 1945, Berlin surrendered to the Russians and the war in Europe all but ended. Germany unconditionally surrendered on May 7th. The Russians lost 80,000 men killed and 275,000 wounded or missing in the lead up to the battle and in the battle itself. Two thousand Russian tanks were destroyed. 150,000 Germans were killed during the battle. 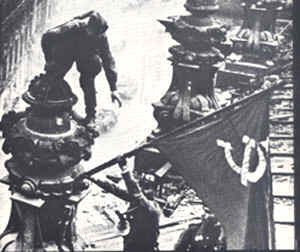 An infantry soldier, Sergeant Shcherbina, was credited with raising the Red Flag on the top of the Reichstag which signalled the effective end of the battle. Why was Stalin so keen to get to Berlin? Zhukov, in particular, suffered high casualties because of Stalin’s insistence on him racing to Berlin rather than using a planned campaign. Stalin would win the kudos of getting to Berlin before the Allies simply because the Allies were too far from Berlin to be a rival in a ‘race’. One theory is that Stalin was desperate for his secret police to get to the Kaiser Wilhelm Institute in Berlin which was the centre of Germany’s nuclear research programme. It was believed that the Institute contained important research material which would bolster Russia’s nuclear programme. The Institute also had a cascading generator which Stalin considered to be vital for any developments in Russia.